Elite Eight Preview: Auburn Takes Down No. 1, but Can the Tigers Survive Kentucky? Duke once again survives, Kentucky holds off a pesky Houston team, Michigan State rolls and Auburn stuns UNC as the Elite Eight is officially set. Let's get right into it and take a look at the four games that will decide the NCAA tournament Final Four once the weekend concludes. West Region: No. 3 Texas Tech vs. No. 1 Gonzaga – Texas Tech made quick work of Michigan on Thursday night as it held the Wolverines to a season-low 44 points, which also tied for the fewest points scored in this year’s tournament. The country’s best defense lived up to its name and absolutely clamped down, while Jarrett Culver carved up the Wolverines' lackluster defensive effort and dropped 22 in the win. Like Michigan, Florida State was eliminated in the Sweet 16 after falling to No. 1-seeded Gonzaga. With four players contributing double-digit points for the Bulldogs and the Zags seamlessly limiting all of the Seminoles’ stars outside of Trent Forrest, Florida State's one-man team couldn’t beat a beautifully balanced Gonzaga squad that was playing at its best. Knocking in 72 points against the long and athletic Seminoles is an impressive feat, so Texas Tech will have to put its magical powers to work if it wants to contain the Zags and their explosive offense in Saturday night’s Elite Eight matchup. It'll be the country’s best defensive and offensive teams meeting in a clash of complete opposites. South Region: No. 3 Purdue vs. No. 1 Virginia­ – The Boilermakers outlasted No. 2 seed Tennessee in an overtime thriller on Thursday night on the backs of big games from guards Carsen Edwards and Ryan Cline. Virginia’s win over Oregon was about as much of a rock fight as all expected, but its suffocating Pack-Line defense secured the win. That same defense is going to be put to work against Purdue’s star shooters, who have amazed with their offense throughout the tournament. The issue: even though the Boilermakers play slow ball, Virginia plays slower. Edwards won’t get nearly as many looks against the Cavaliers as he did against the Vols. Every possession counts when playing Tony Bennett’s team and Purdue will have to take smart shots to keep up with the South’s top seed. The Cavaliers—who have struggled to shoot in the tournament—will have to get things going offensively Saturday night if they want to punch their ticket to Minneapolis. East Region: No. 1 Duke vs. No. 2 Michigan State­ – Michigan State became elite with an 80­–63 victory over No. 3-seeded LSU. The Spartans have freshman forward Aaron Henry—20 points, eight rebounds and six assists on 64.3% shooting—and Cassius Winston, who went for 17 and eight assists, to thank for their win. Michigan State took the lead early on Friday and the Tigers failed to erase the deficit. The Blue Devils, on the other hand, had to fight a little harder for their slot in Sunday’s game. Duke escaped its second close call of the tournament with a 75–73 win over a threatening Virginia Tech. Zion led the way with 23 points, on 11-of-14 shooting, six rebounds and three blocks, but it was point guard Tre Jones who followed with 22 points, powered by five threes. Jones and RJ Barrett, who added 18 points, combined for 19 dimes as the Blue Devils somehow survived. It won’t be an easy win for either, but you can count on a good game when Duke and Michigan State meet in the Elite Eight. A clash between Coach K and Tom Izzo, with Zion Williamson and Cassius Winston leading the way for their respective teams, is bound to be one for the books. Midwest Region: No. 5 Auburn vs. No. 2 Kentucky – The Tigers stunned top-seeded North Carolina on Friday night, taking down the first No. 1 seed of the tournament with a dominant 97–80 win to advance to their first Elite Eight in 33 years. Auburn matched the Tar Heels' fast-paced play with a block party and a three parade as it sunk 17 treys in the victory. Sophomore forward Chuma Okeke posted a double-double of 20 points and 11 rebounds but made an early exit with an apparent left knee injury. Okeke’s status for Sunday remains unknown, but the Tigers are going to need every point they can get against a Wildcat team led by PJ Washington­—recently returned from injury and came off the bench—and freshman Tyler Herro, who helped Kentucky survive a scare from No. 3-seeded Houston on Friday night. If the Wildcats can’t get more momentum going on offense against hot-handed Auburn, the Wildcats—who only scored 62 in their win over the Cougars—could be in trouble. SI's Emily Caron makes her picks for Saturday's two-game Elite Eight slate. No. 1 Virginia over No. 3 Purdue­: Carsen Edwards & Co. are going to have a much harder time getting shots off against the Pack-Line D than they did against Tennessee on Thursday. If the Cavaliers can limit either Edwards or sharpshooter Ryan Cline, they should be in good shape. No. 1 Gonzaga over No. 3 Texas Tech: Texas Tech made Michigan look really, really bad on Thursday night, but Gonzaga’s offense is significantly better than the Wolverines'. The Bulldogs are too balanced of a team for the Red Raiders' defense alone to carry them to the Final Four. Auburn pulls off another upset and takes down No. 2 Kentucky to advance to its first Final Four in program history. The Tigers were streaky during the regular season but they’ve been on the hot side of that wave during the tournament, knocking off No. 4 Kansas and No. 1 Carolina with two strong (and insanely high-scoring) wins. 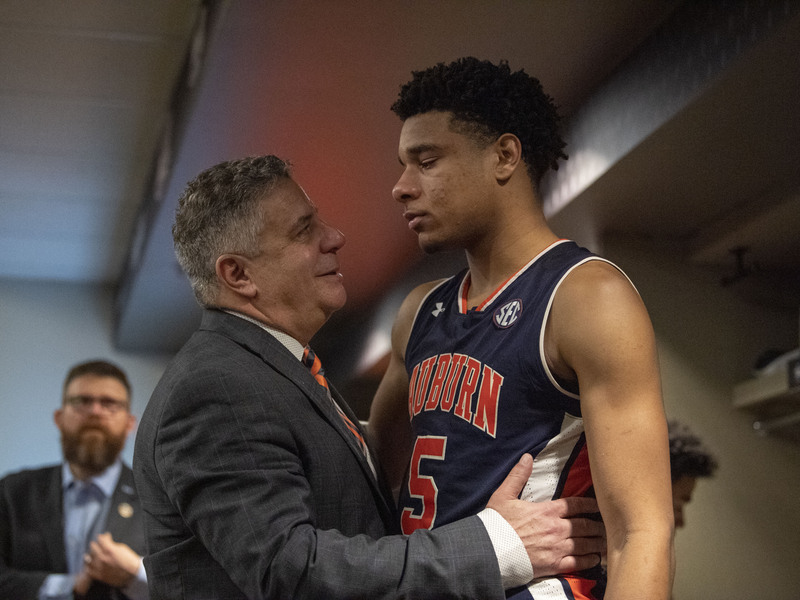 If they can keep the on-fire offense flowing without sophomore forward Chuma Okeke, they could continue to wreak havoc throughout the Midwest Region as March Madness continues. Unfortunately he's busy on the golf course right now.